This is my first attempt at this. Images by JSudoku which you can use for electronic viewing/assistance. Puzzle 01 was modified from the original very difficult puzzle which is essentially a machine excercise. Last edited by tarek on Wed Oct 24, 2018 6:45 pm, edited 1 time in total. Do you have a line format of the solution? I already did the visual check. My solver solves your puzzle. And I know for very sure I never programmed any fish. Only pointing pairs, hidden/naked subsets and group-interactions (locked subsets). dyitto wrote: I already did the visual check. dyitto wrote: Do you have a line format of the solution? I guess you don't need it now that you've solved it. The central grid has Disjoint groups (DG) & X diagonals. Last edited by tarek on Tue Jun 07, 2011 3:14 pm, edited 1 time in total. This puzzle is not human-solvable. It may prove even difficult for machines to solve. I stopped JSudoku after 10 minutes ... So unless you've got a good machine don't bother. I will keep it as a challenge for programmers here to provide the solution. Last edited by tarek on Mon Oct 15, 2018 2:12 pm, edited 1 time in total. This is really a very hard puzzle. It took my "machine" quite a while to solve it. But I can testify that it has one unique solution (see below and attached). My respect to you, Tarek!! How do you actually produce these puzzles? I would love to discuss this with you. Unfortunately, work & time constraints prevent sudoku dedication now. I keep making promises (more like false hopes) about finding time to continue forum mail/posts/threads especially what I started. So I'll stop making promises for now and continue hoping for free time sometime in the near future. tarek wrote: Unfortunately, work & time constraints prevent sudoku dedication now. I keep making promises (more like false hopes) about finding time to continue forum mail/posts/threads especially what I started. So I'll stop making promises for now and continue hoping for free time sometime in the near future. I'm still working on your Bank Holiday 1108 Sumo Special, although I think I'm stuck for now. I'll probably have to throw it into SudokuSolver and get a hint. I really have no idea what techniques it requires, and whether some of those are out of my league for now. 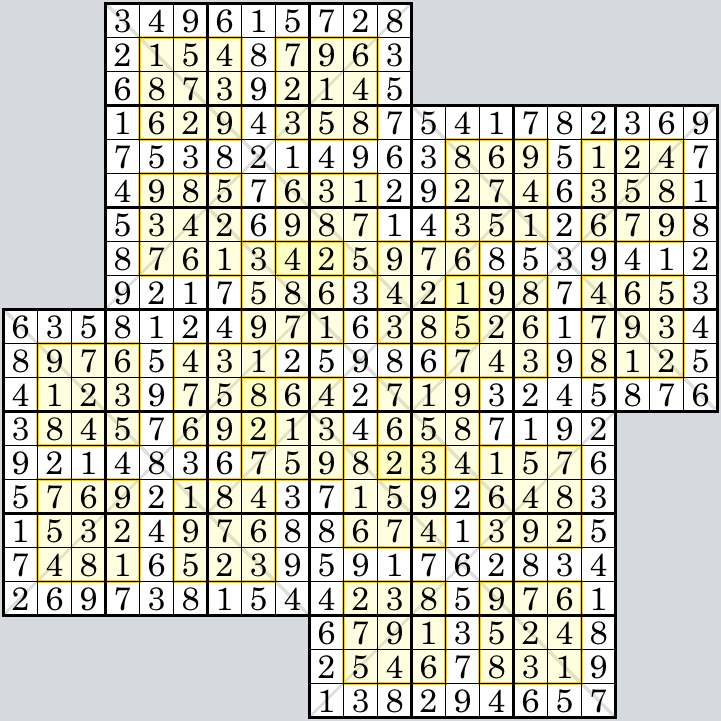 It is strange that JSudoku didn’t find ANY solution when we actually do have at least one solution. I’m casting some doubts on JSudoku’s result now!!! I can't help with JSudoku, but I can confirm that the pictured puzzle has just the one solution. I get several (individually) redundant clues, too ... shown below. 4 . . . 8 . . . .
. . . . 3*. . . . . 2 . . . . 3*. .
. . . 5 . . . . . . . 8*. . . . . .
. . 6 . . . . . . . . . 1 . . . . .
5*. . . . . . . . . . . . . 9*1 . .
. . . . . 3*. . . . . . . . . 7 . .
. . . . . . 1 . . . . . . . 5 . . .
. . 4 . . . . 7*. . . . . 8*. . . .
One (180 degree symmetric) clue pair can be removed, leaving just one redundant clue. . . . . . . . . . . 2 . . . . 3*. .
. . . 5 . . . . . . . 8 . . . . . .
5 . . . . . . . . . . . . . 9 1 . .
. . . . . 3 . . . . . . . . . 7 . .
. . 4 . . . . 7 . . . . . . . . . .
Edited once: after realizing that I was missing one of the original clues. 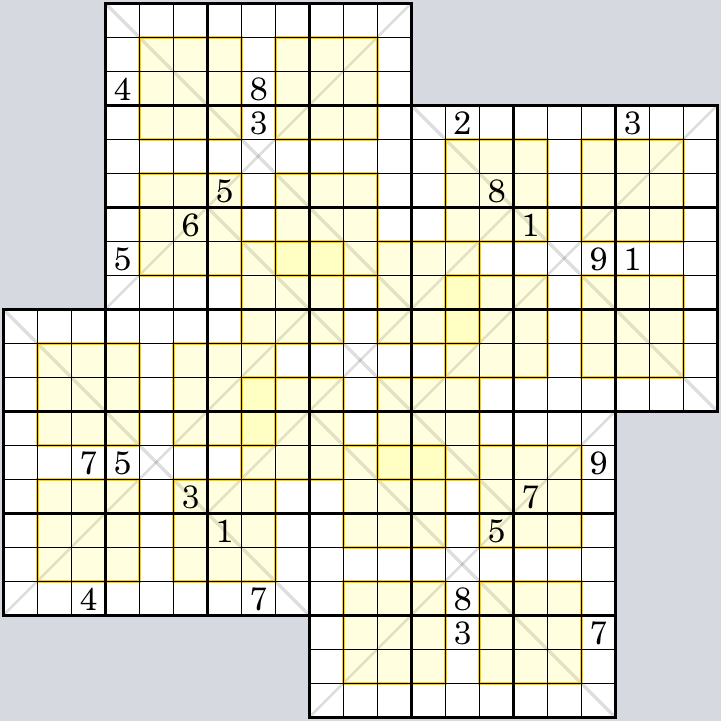 blue wrote: I can't help with JSudoku, but I can confirm that the pictured puzzle has just the one solution. Thanks blue for the confirmation. I can't find any traces of my attempts to minimize the puzzle, so thanks for the further minimization. Here is a Windmill WX with a single fish. Creating Fish-puzzles is difficult. Fish is rare. It took me about 15 attempts before this first fish-puzzle came up, using SiSeSuSo .